Dr. Vikram Rao, has joined the BioLargo management team as a senior advisor. Rao is working closely with BioLargo to help capitalize on opportunities to commercialize its technology in the water and energy fields. Having spent more than 30 years at Halliburton, most recently serving as senior vice president and chief technology officer, Rao now serves as the Executive Director of the Research Triangle Energy Consortium(RTEC). RTEC was formed in 2007 by the University of North Carolina at Chapel Hill, Duke University, North Carolina State University and the RTI (Research Triangle Institute) International to highlight energy issues, better inform academics, industry, policy makers and investors, and conduct research and development to create sustainable sources of energy. The recent unrest in the Middle East has caused a spike in the price of oil, with immediate impact on gasoline price, while the price of natural gas has remained stable. This underlines the principal difference in these two essential fuels. Oil is a world commodity while gas is regional. They also serve largely different segments of end use. Consequently, the fact that today’s gas is one-fourth the price of oil in terms of energy content has little relevance in the main. However, if the energy industry believes that this differential will hold for a long time, technology enabled switching will occur. In this blog post, we will predict a shale gas enabled future of gas at low to moderate price for a long time. At the same time, we subscribe to the view of an upcoming plateau in oil production, which will drive oil prices higher. These two trends taken together assure a high oil/gas price ratio. This will cause systematic switching where possible. We discuss two essential areas where this is likely: transport fuels and propylene, the latter being the precursor to many important industrial goods, principally polypropylene. Why natural gas price will stay low to moderate: Shale gas has unique economic characteristics when compared with conventional gas. It is located on land and at relatively shallow depths. The exploitation of the resource does have environmental hurdles, but with the proper combination of technology, transparency and regulatory oversight, these can be traversed. If allowed to be accessed, shale gas offers the promise of cheap gas for decades. If demand drives up price, this resource can be accessed within 90 days of the decision to do so, provided access and delivery infrastructure are available. This single fact will keep a lid on the price and discourage speculators. To give a frame of reference, conventional offshore gas has a lead time of at least four years. That is the sort of lead time this industry is accustomed to. So a fast response lid on prices is a new phenomenon, driven by this unusual new resource. Natural gas prices can be expected to stay in a tight band between $4 and $6.50 per million BTU, with excursions to $8. The floor will be driven by demand and the ceiling by the aforementioned fast response to new production. 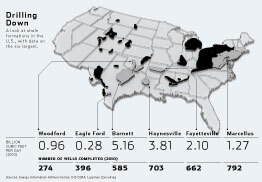 At least two oil companies operating in the Marcellus in Pennsylvania have stated that at $4, they have strong profits. Newer technologies and further experience will continue to drive down production costs. One example is refracturing of existing wells after initial production tails off. A unique feature of this type of reservoir is that a properly designed refrac will deliver new gas approaching initial production numbers. This would be at a fraction of the original cost because the well already exists. This and other technological advances will, in most instances, more than offset the costs of better environmentally driven practices. Impact of predictably low gas prices: High oil/gas price ratios will drive oil substitution. Here we will discuss just two areas of impact. The obvious high volume one is a replacement of the oil derivatives for transport. Technology exists today to convert natural gas to gasoline, diesel or jet fuel. Predictably low cost natural gas will spur further improvements regarding the economics of these processes. Also, Liquefied Natural Gas (LNG) for long haul transport and Compressed Natural Gas (CNG) for buses, taxis and even cars will be strongly enabled. An interesting analysis is the impact on petrochemicals such as propylene. One of the derivatives, polypropylene, is ubiquitous in our lives: roofing, carpets, bottles and bendable plastics, to name a few. For years when oil and gas pricing was in greater parity, propylene was a bi-product of ethylene production in oil refineries. It is also produced by tweaking the catalytic cracking process, at the cost of a smaller gasoline fraction. A refinery can change the mix essentially at will, presumably based on the relative profit potential. But with a worsening oil/gas price ratio, ethylene production increasingly switched to a gas feed stock. Unfortunately, this process produces very little propylene as a bi-product. So, as reported recently in the Economist, in the last two years propylene price has gone up 150%. A predictably low price for gas will allow for plants dedicated to propylene production from gas. At least three companies, Lurgi, Total and UOP, have the technology at an advanced state. This would make the greatest sense for gas that is otherwise stranded – Prudhoe Bay gas comes to mind. The gas pipeline from Alaska is no longer viable if shale gas production in the US and Canada continues apace. Produced gas continues to be reinjected. The real price for this gas is well below the price in the Lower 48. 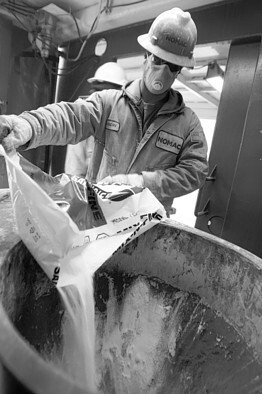 The economics of conversion to transport fuel or plastics feed stock is compelling. Sustained high oil/gas price ratios are predicted. This will drive a secular shift from oil to gas. With the nuclear industry in crisis and oil prices on the rise, could the solution to our energy problems be in the ground at home? Daniel Yergin on the promise of shale gas. A drilling rig in western Pennsylvania. Shale gas reserves in America and Canada may be enough to last for more than 100 years. In the early 1980s, George P. Mitchell, a Houston-based independent energy producer, could see that his company was going to run out of natural gas. Almost three decades later, the results of his effort to do something about the problem are transforming America's energy prospects and the calculations of analysts around the world. Back in those years, Mr. Mitchell's company was contracted to deliver a substantial amount of natural gas from Texas to feed a pipeline serving Chicago. But the reserves on which he depended were running down, and it was not at all clear where he could find more gas to replace the depleting supply. Mr. Mitchell had a strong hunch, however, piqued by a geology report that he had read recently. In an interview with David Wessel, Daniel Yergin, author of "The Prize," states that the turmoil in the Middle East is a "sea change" for the global oil market and that the U.S. and emerging markets are most economically vulnerable to rising oil prices. Perhaps the natural gas that was locked into shale—a dense sedimentary rock—could be freed and made to flow. He was prepared to back up his hunch with investment. The laboratory for his experiment was a sprawling geologic formation called the Barnett Shale around Dallas and Fort Worth. Almost everyone with whom he worked was skeptical, including his own geologists and engineers. "You're wasting your money," they told him over the years. But Mr. Mitchell kept at it. The payoff came a decade and a half later, at the end of the 1990s. Using a specialized version of a technique called hydraulic fracturing (now widely known as "fracking" or "fracing"), his team found an economical way to create or expand fractures in the rock and to get the trapped gas to flow. Today, in an age that craves innovation in energy, George Mitchell's breakthrough in the Barnett Shale has opened the door to a potentially profound change in the global energy equation. What has become known as the "unconventional-natural-gas revolution" has turned a shortage into a large surplus and transformed the natural-gas business, which supplies almost a quarter of America's total energy. This revolution has arrived, moreover, at a moment when rising oil prices, sparked by turmoil in the Middle East, and the nuclear crisis in Japan have raised anxieties about energy security. Government and producers alike have turned their attention back to domestic resources. 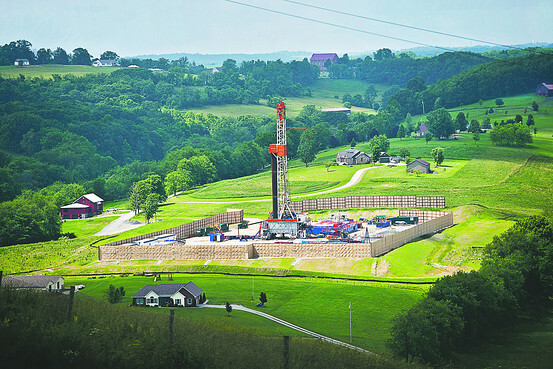 The rapid rise of shale-gas production has also drawn scrutiny and controversy. Some environmental groups say that the process threatens to contaminate drinking-water supplies. The industry, for its part, points to a long safety record, with some form of fracking having been used in more than a million wells in the U.S. since the end of the 1940s. As late as 2000, shale gas was just 1% of American natural-gas supplies. Today, it is about 25% and could rise to 50% within two decades. Estimates of the entire natural-gas resource base, taking shale gas into account, are now as high as 2,500 trillion cubic feet, with a further 500 trillion cubic feet in Canada. That amounts to a more than 100-year supply of natural gas, which is used for everything from home heating and cooking to electric generation, industrial processes and petrochemical feedstocks. The effects of the "shale gale" are also being felt in the rest of the world, changing the economics of the liquefied-natural-gas business. Its impact on international energy relations could be significant. Some proponents believe that the U.S., once thought to be short of natural gas, could even become a natural-gas exporter. It is a revolution that has progressed in stages. Hydraulic fracturing uses the concentrated pressure of water, sand and a small amount of chemicals to promote the flow of oil and gas in a reservoir. Mitchell Energy's breakthrough was to apply one particular approach—"light sand fracking"—to break up what had seemed impermeable: hard shale rock. With this technique, the company's gas output began to climb, but capitalizing on the innovation would require a good deal more money. In 2002, Mr. Mitchell merged his company into a larger independent, Devon Energy. Devon had expertise in a second technology that would be critical to the shale-gas revolution—horizontal drilling. Advances in control and measurement allowed operators to drill down to a certain depth and then to drill at an angle or even sideways. This exposes more of the reservoir, permitting the recovery of a much greater amount of gas (or oil). "At that time," said Larry Nichols, the chairman of Devon, "absolutely no one believed that shale drilling worked, other than Mitchell and us." Devon experimented with yoking the two technologies together. In 2003, the company drilled 55 wells in the Barnett Shale, optimizing the combination of fracking and horizontal drilling. A worker pours salt into a mixer as he prepares drilling fluid. The Road to a Clean Energy Future? As Devon's gas production started to rise, other independents saw what was happening and honed the techniques further. But the wider energy industry remained focused on what seemed to be the imminent shortfall of conventionally produced natural gas in North America, which, it was thought, would make it necessary to import large quantities of liquefied natural gas from places like Trinidad, Qatar, Algeria and even the Russian island of Sakhalin. Then something surprising happened: Thanks to shale gas, overall U.S. natural-gas production went up from 2007 to 2008. That was the signal to the rest of the energy industry, and larger companies were soon turning to shale. It was not until the fall of 2009, however, that leaders in the nation's capital woke up to the fact that something was changing in the U.S. energy mix. It's now well-recognized. In his energy speech on Wednesday, President Barack Obama said, "Recent innovations have given us the opportunity to tap large reserves—perhaps a century's worth—in the shale under our feet. The potential here is enormous." In the energy industry, use of the new technology quickly gathered speed. The know-how was applied across North America, in such shale formations as Haynesville, mostly in Louisiana; Eagle Ford in South Texas; Woodford in Oklahoma; Horn River and Montney in British Columbia; Duvernay in Alberta; and the "mighty Marcellus," the huge formation that spreads from Pennsylvania and New York down into West Virginia. Gas output rose dramatically, and the anticipated shortfall turned into a large surplus. As the volume rose, the inevitable happened—prices came down. Substantially. Today, natural-gas prices are less than half of what they were just three years ago. Shale gas changed the strategic direction of the industry. Larger companies have maintained their commitment to existing multibillion-dollar liquefied-natural-gas projects around the world, but they now intend that gas for markets in Europe and Asia, not North America. At the same time, they have made new multibillion-dollar investments in shale-gas extraction in North America. Outside the U.S., potential reserves of shale gas have been identified in countries from Mexico and Argentina to Algeria. Chinese interest is rising swiftly, both for shale gas and for another form of unconventional natural gas, coal-bed methane. It is now thought that Europe's unconventional-gas potential may be as great as North America's. Even with increased energy efficiency over the next two decades, growing demand for power in the U.S. could require the equivalent of 540 new coal plants or 200 new nuclear power plants. Coal is inexpensive and abundant, but there is regulatory and environmental opposition to its use because of carbon and other emissions. Nuclear power is carbon-free and has evolved new passive safety features, but it is expensive and, especially after the catastrophe in Japan, faces regulatory and political uncertainty. In most states, utilities are now required to have a certain share of renewable energy sources. Most of it has been wind power, but wind is still small-scale and relatively expensive. Because it supplies energy only intermittently, it can be difficult to integrate into the electric grid. Further complicating the picture for all of these rival energy sources is uncertainty about what kind of new carbon regulations might come from Congress and the Environmental Protection Agency. Power companies have been reluctant to make a larger commitment to natural gas because of worries about supply and price volatility. Over the past 30 years, natural gas has been, at different times, abundant and cheap or scarce and expensive. Utility executives made commitments in the late 1990s to what was supposed to be cheap natural gas, only to see prices spike as supplies tightened, contributing to the California power crisis and sending some companies into bankruptcy. But shale has changed the equation. Abundant, relatively low-priced supplies now make natural gas a highly competitive alternative to both nuclear and wind power and even to coal generation. It has the added advantage of being relatively low-carbon (though even natural gas will be constrained if the U.S. adopts a policy similar to the European Union's objective of an 80% reduction in carbon emissions by 2050). Could natural gas also be a game changer for transportation? That is much more of a challenge. Automakers and the fuel-supply industry are already dealing with a multitude of imperatives—more fuel-efficient cars, more biofuels, plug-in hybrid electric vehicles, pure electric vehicles. Making a major push for natural-gas vehicles would add yet another set of mandates and incentives, including the creation of a costly new fueling infrastructure. Moreover, the price advantage of natural gas over gasoline shrinks as cars become more fuel-efficient. The most obvious growth area for natural gas in transportation is for urban fleets (taxis, buses and other service vehicles) that have access to a central refueling facility. Some argue for adding long-distance trucks to that list. But if there is a strong large-scale push in general transportation, it might make the power industry fearful of having to compete against motorists for natural-gas supplies and thus more cautious about making a major commitment themselves. The arrival of shale gas has received a mixed welcome from environmentalists. Some applaud it as a lower-carbon source of electricity. It is also an "enabler" for renewable energy, providing a source of electricity that can step in to fill the gap when the wind is not blowing or the sun is not shining. "The sudden abundance of low-cost natural gas is a gift," said Tim Wirth, president of the United Nations Foundation, who, as a U.S. senator, ran the hearings that turned climate change into a national issue. "But it is a gift that has to be managed properly." Mr. Wirth, like other pro-gas environmentalists, has called on the industry to set standards and create an operating compact with regulators. Criticism of shale gas by some environmentalists has risen as operations have spread into regions that are largely unfamiliar with modern oil and gas drilling. Some worry about the amount of water used in the process. 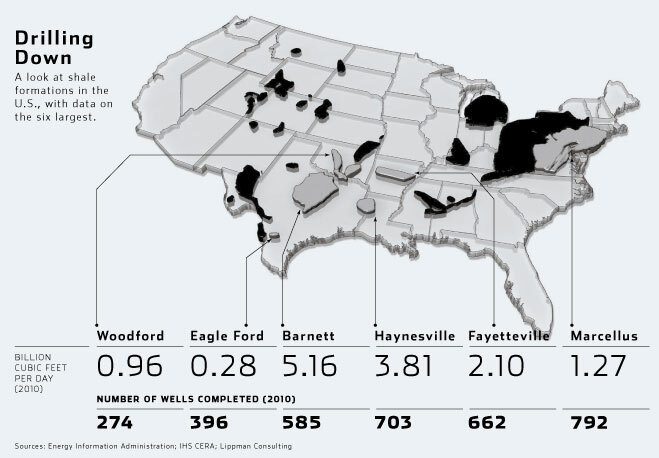 But last year, the 3,500 shale-gas wells drilled in the U.S. used only about 0.02% of total water used in the U.S. Concerns also have been raised about the possibility that hydraulic fracturing could contaminate the aquifers that supply drinking water. But fracking occurs below drinking-water aquifers, separated by a mile or more of impenetrable rock. In Texas, the birthplace of the shale-gas revolution, there is currently a stand-off between the federal Environmental Protection Agency and the state Railroad Commission, which regulates oil and gas production. The EPA maintains that two water wells in Parker County, west of Fort Worth, were contaminated by gas from hydraulic fracturing more than a mile below it. The Texas Railroad Commission, using chemical fingerprinting, maintains that the EPA is wrong and that the gas seeped into the well from a shallow formation a few hundred feet beneath the surface, much closer to the water wells. Environmental attention has recently shifted to the wastewater that comes back to the surface during drilling. As in any industrial activity, this water has to be either recycled or disposed of in an environmentally appropriate way. In many parts of the country, companies inject the wastewater into deep disposal wells. It is not clear whether Pennsylvania has enough of the deep geological formations necessary for such disposal. For the vast Marcellus shale, the issue is whether the state's wastewater treatment facilities are adequate and can keep up with the pace of expansion in shale drilling. The industry has moved to increase the amount of wastewater recycled in drilling operations, currently at over 70% by some estimates. 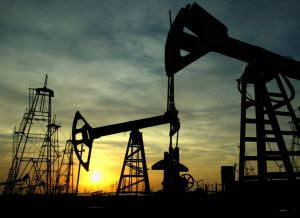 The extraction of oil and gas is a highly regulated activity. Historically, the actual drilling, including fracking, has been regulated by states. Virtually all disposal of wastewater is regulated by the EPA, either under the Safe Drinking Water Act or the Clean Water Act, but the EPA may delegate actual enforcement of these regulations to the states. In an era of heightened environmental awareness, any incident, even involving a single water well, can become a national event. As a recent analysis from the Massachusetts Institute of Technology Energy Initiative put it, "With over 20,000 shale wells drilled in the last 10 years, the environmental record of shale-gas development is for the most part a good one. Nevertheless, one must recognize…the damage that can be caused by just one poor operation." Debates will continue about state versus federal regulation, industry standards and the underlying facts in particular cases. What many analysts expect to see is the emergence of a set of "best practices," endorsed by both regulators and industry, that are tailored to the specific characteristics of the diverse basins across the country. For shale gas production to succeed on a massive scale, public confidence will be essential. All of these issues have emerged relatively recently, and it will take some time to sort them out. But we should not lose sight of the larger picture: the potential for a century's worth of inexpensive, environmentally attractive energy. At a time of increased energy anxiety, the shale gas revolution is both a major innovation and a formidable new addition to our energy supply. George Mitchell was certainly on to something. —Mr. 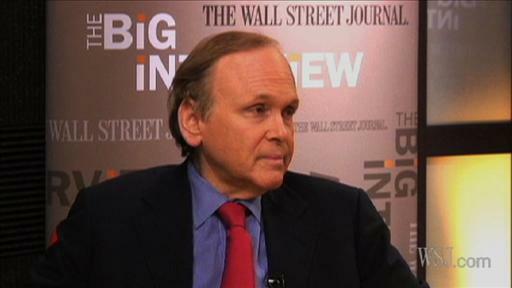 Yergin is chairman of IHS Cambridge Energy Research Associates, an energy research and consulting firm. His new book "The Quest" will be published in September. He received the Pulitzer Prize for his book "The Prize: The Epic Quest for Oil, Money and Power."